These fritters are easy to make and virtually fail-proof, unlike the more finicky hash browns. 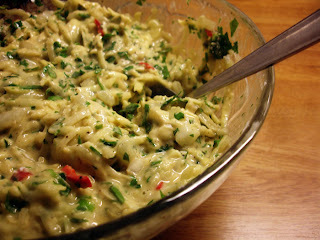 They are also very versatile: as a side dish, as part of a selection of finger-foods, or with a salad as the main meal. 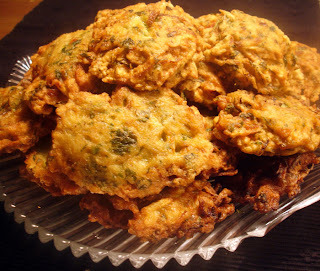 Harissa or yogurt dips (mild or spicy) are great sauces to serve alongside the fritters. This is the sort of recipe that is easily adapted to taste, or what you have in your store cupboard: vary the seasonings and herbs, add vegetables (e.g peas, paprika, leek, cauliflower) or use up leftovers (e.g chopped cooked chicken, cheese). Grate the potatoes using the largest holes of your grater, then combine with the rest of the ingredients in a large bowl. 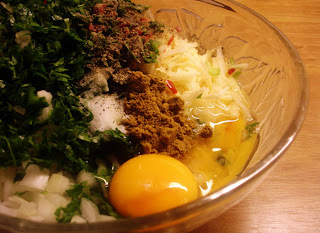 Each fritter should use one heaped tablespoon of the mixture. Heat the oil in a frying pan. Fit in as many fritters as you can at a time. Fry on medium heat until golden on each side. Remove from oil and put on kitchen towel to remove excess oil. 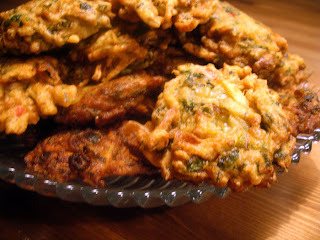 The fritters should be crisp on the outside and soft on the inside and must be served warm. 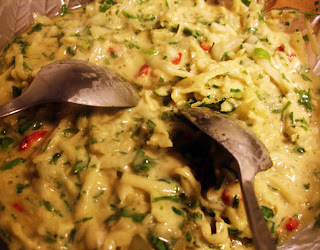 If you have not used the optional chilies in the recipe, or if you like extra-spicy food, serve with harissa. 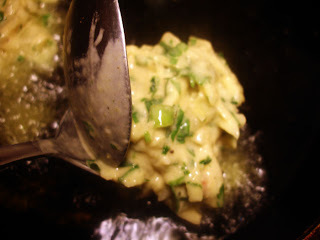 Otherwise, serve with yogurt dips: either mild cucumber and mint yogurt sauce or spicy garlic, chili and coriander yogurt sauce.